Escherichia coli infections are becoming difficult treated because of extensive resistance to antibiotic among these organisms and manufacturing extended-spectrum beta lactamases enzymes (ESBLs) make them resistant to beta-lactam antibiotics. This study aims to offer a summary of the main horizontal transmission apparatuses between E. coli as well as Staphylococcus aureus and emergence resistance to antibiotics. Fifty of the E. coli and 50 of S. aureus isolates were examined to obtain minimum inhibitory concentration (MIC) results. These isolates were then tested by conventional polymerase chain-reaction for the existence or absence the sulfhydryl variable SHV beta-lactamase genes. About (48%) of isolated E. coli, while (32%) of S. aureus were revealed SHV gene. The aim of the present work was to study the possibility of producing an effective bacteriocin from bacteria naturally exists in the mouth. Streptococcus salivarius KA101 was selected among 120 oral isolates collected from healthy people based on its ability to produce an effective bactericidal bacteriocin. Modified tryptic soy agar with 2% yeast extract and 0.1% calcium carbonate was the best medium for the production of bacteriocin with an activity of 40 AU/ml. Response surface methodology (RSM) based on central composite design (CCD) was employed to build a model in order to evaluate the optimum effective factors for bacteriocin production using four factors: yeast extract, CaCO3, pH and incubation time. Based on the optimization plot generated by RSM, the suggested optimal concentrations of yeast extract and CaCO3, as well as pH and incubation time for maximum bacteriocin production (80.2 AU/ml), were 13 g/l, 1.4 g/l, 7 and 24 hrs respectively. The results showed that bacteriocin was active for 30min at 20, 30 and 40˚C while 50% of its activity was lost at 50˚C. In addition, maximum bacteriocin activity was observed at pH 6 and 7 for 30min and disappeared completely at pH 4 and 9. Moreover, bacteriocin activity was completely lost after 90min of incubation with trypsin and pepsin which confirm its protein nature. Antimicrobial activity of bacteriocin was tested against 47 clinical isolates collected from patients suffering from different dental diseases. The results showed that the bacteriocin had an inhibitory activity against different isolates of S. mitis, S. mutans, S. oralis and Enterococcus. Radon is the air contaminant radioactive gas which people exposed to, is a reason for lung damages and lung cancer. The areas that are subject to high radon levels are found by radon concentration measurement. The radon activity concentration, annual effective dose, and potential alpha energy concentration (PAEC), were measured in houses of Ainkawa region using CR-39 solid state nuclear track detectors SSNTDs with the sealed-can technique. In the present paper the estimated values for radon activity concentration are in the range 55.99-112.8 Bq/m3 with 84.30 Bq/m3 as a mean value, the range of annual effective dose are 1.411-2.872 mSv/y, with mean value 2.124 mSv/y, and the potential alpha energy concentration range are 6.0533-12.323 mWL with mean of 9.1133 mWL. The mean value of the radon concentration is below of 100 Bq/m3 the reference level of (WHO) World Health Organization, and well below of UK National Radiation Protection Board (NRPB) and European Commission Recommendation Level of 200 Bq/m3. Entrance Surface Dose for patient`s undergoing X-ray examinations at Sebha medical center "Libya"
Diagnostic X-ray is one of the ionizing radiation that plays an important role in medical examination. Despite its great benefit, it is considered the largest source of artificial radiation exposure to public. The aim of the study is to measure the entrance surface dose (ESD) of patients undergoing chest, lumber spine and knee X-ray examination using TLD-100. The mean Entrance surface dose of chest (PA), lumber spine (AP, LAT) and knee (AP, LAT) are 1.3mGy, 8.57mGy, 21.5mGy and 0.49mGy, 0.48mGy respectively. The ESDs measured were found to be higher than the published work. Diagnostic X-ray is one of the ionizing radiation that plays an important role in medical examination. Despite its great benefit --- it is considered the largest source of artificial radiation exposure to public. The aim of the study is to measure the entrance surface dose (ESD) of patients undergoing chest --- lumber spine and knee X-ray examination using TLD-100. The mean Entrance surface dose of chest (PA) --- lumber spine (AP --- LAT) and knee (AP --- LAT) are 1.3mGy --- 8.57mGy --- 21.5mGy and 0.49mGy --- 0.48mGy respectively. The ESDs measured were found to be higher than the published work. The work done in this paper to study properties for nitrogen plasma generated by method electrical discharge when the aluminum was a target. Experimental study on the effect electrodes material, applied voltages on spectroscopic parameter for DC discharge plasma in Nitrogen gas using planner electrodes were done. The electron temperature, increase with increasing applied voltage from (700 to 1100) V. While the plasma density, calculate by Stark broadening effect, which increase with it. The peaks intensities for N2 transition (λ= 336.6 nm and 391.4 nm) increase with increasing applied voltage. The vibrational energy (TVib) for N2 molecular increase from 0.165 to 0.185 eV with increasing applied voltage from (700 to 1100) V, which less than the calculated electron temperature. This study was carried out to estimate the effect of shaliness on water saturation from TN field of Niger Delta. The conventional Archie and the Shaly-sand water saturation models were used in the evaluation of wells. Two sand layers (Sand 01 and 02) were mapped with thicknesses range from 76.8ft to 119.3ft across the three wells for Sand 01 and 187.5 to 339.9ft across wells TN_1 and TN_4 for Sand 02. The cross plot of the effective porosity (φe) versus volume of shale (Vsh) that was carried out, reveals a decrease in the effective porosity with an increase in shale volume. This depicts a laminated shale pattern across the entire reservoir sands. The petrophysical estimation of water saturation from the conventional method and the Shaly-sand models of Simandoux and Indonesia, show a clear disparity in water saturation. This disparity recorded, was attributed to the degree of shaliness that is associated with the reservoirs, suggestive of over estimation of water saturation of the reservoirs by the conventional model. The study intends to interpretation of well logs to determine the petrophysical parameters for Khasib, Tanuma, and Sa'di formations in Halfaya Oil Field. Where this field is located 30 kilometers south-east of the Amara city and it is considered as one of the important fields in Iraq because of the high production of oil, because Khasib, Tanuma, and Sa'di are f carbonates reservoirs formations and important after the Mishrif Formation because of the lack of thickness of the formations compared to the amount of oil production. The Matrix Identification (MID) and the M-N crossplot were used to determine the lithology and mineralogy of the formations; through the diagrm it was found the three formations consisted mainly of calcite with some dolomite. Density – Neutron cross plot for lithology identification which shows that the formations are mainly consist of limestone with little shale. In this study, lateral groundwater inflow was examined, according to the phenomena of groundwater mixing, groundwater flow and groundwater chemistry. The study region is composed of different aquifer systems; including karst-fracture media (Rattga-Jeed carbonates aquifer), fissure–porous media (Mullusi, Mullusi-Ubaid, Hartha-Rutba, and Digma-Tayarat aquifers) and porous media (Permo-carboniferous clastics rocks of Ga’ra aquifer).The aquifers are vertically super-imposed or of lateral contacts make open hydraulic connection between aquifers system. There is a severe shortage of water resources in the region because of rare precipitation and strong evapotranspiration. These conditions have hampered eco-environmental improvement. The aquifers should be considered as important water reserves for industrial use in mineral exploration and exploitation, as well agricultural purposes. The monitoring of groundwater quality network consist chemical variables (major ions concentration) and groundwater levels in sixty four water wells. The study describes the phenomena of lateral groundwater inflow (hydraulic connection) among aquifers systems using hydrogeologic phenomena compiled with the application of hydrochemical characterization on Piper Trilinear Plot. The results are supported and also benefit in studying the rational development of groundwater resources, which will significantly interpret the difference between supply and demand of groundwater, where the lateral groundwater recharge is a key factor in water balance studies, especially in semi-arid areas. Four mixing phenomena detected by Piper Trilinear Plot proved the existence of four trends of lateral groundwater flow interconnections within the hydrogeologic system. Accordingly, Al-Hamad complex hydrogeologic system can be classified into four subsystems, Mullusi-Ga’ra and Digma-Tayarat subsystem, Mullusi-Jeed and Rattga-Jeed subsystem, Mullusi-Rutba and Muhaywir-Ubaid subsystem, Mullusi and Mullusi-Ubaid subsystem. Our main interest in this study is to look for soft semi separations axioms in soft quad topological spaces. We talk over and focus our attention on soft semi separation axioms in soft quad topological spaces with respect to ordinary points and soft points. Moreover study the inherited characteristics at different angles with respect to ordinary points and soft points. Some of their central properties in soft quad topological spaces are also brought under examination. The main goal of this paper is to study applications of the fractional calculus techniques for a certain subclass of multivalent analytic functions on Hilbert Space. Also, we obtain the coefficient estimates, extreme points, convex combination and hadamard product. Multivalent functions --- Fractional calculus --- Extreme points --- Convex combination --- Hilbert Space --- Hadamard product. In this paper, we introduce and study new classes of soft open sets in soft bitopological spaces called soft (1,2)*-omega open sets and weak forms of soft (1,2)*-omega open sets such as soft (1,2)*-α-ω-open sets, soft (1,2)*-pre-ω-opensets, soft (1,2)*-b-ω-open sets, and soft (1,2)*-β-ω-open sets. Moreover; some basic properties and the relation among these concepts and other concepts also have been studied. In this paper, we introduce the concept of e-small Projective modules as a generlization of Projective modules. : projective modules --- e-small submodules --- e-small projective modules. In this paper, a hybrid image compression technique is introduced that integrates discrete wavelet transform (DWT) and linear polynomial coding. In addition, the proposed technique improved the midtread quantizer scheme once by utilizing the block based and the selected factor value. The compression system performance showed the superiority in quality and compression ratio compared to traditional polynomial coding techniques. Image compression --- polynomial coding --- and midtread adaptive quantizer. Temperature predicting is the utilization to forecast the condition of the temperature for an upcoming date for a given area. Temperature predictions are done by gathering quantitative data in regard to the current state of the atmosphere. In this study, a proposed hybrid method to predication the daily maximum and minimum air temperature of Baghdad city which combines standard backpropagation with simulated annealing (SA). Simulated Annealing Algorithm are used for weights optimization for recurrent multi-layer neural network system. 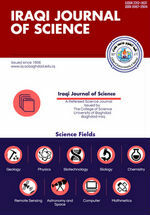 Experimental tests had been implemented using the data of maximum and minimum air temperature for month of July of Baghdad city that got from local records of Iraqi Meteorological Organization and Seismology (IMOS) in period between 2010 to 2016. The results show that the proposed hybrid method got a high accuracy prediction results that reach nearly from real temperature records of desired year. Artificial Neural Network --- Backpropagation Neural Network --- Simulated Annealing --- Prediction Air Temperature. Data transmission in public communication system is not safe since of interception and improper manipulation by attacker. So, the attractive solution for these problems is to design high secure system that reduce the ability of attacker from getting sensitive information such as (account ID, passwords, etc.). The best way is combine two high secure techniques: steganography technique, which is the method of hiding any secret information like data, password and image behind any cover file and cryptography, which is convert the data to unreadable data. This paper suggests a crypto-stego authentication method to provide a highly secured authentication. The proposed method is utilized audio steganography and AES Cryptography. The authentication key (password) is spilt to two parts, the first half is used as input text to stego-crypto process while the second half used as crypto key. The crypto key is encrypted using HMAC-SHA256 hash algorithm and sent to server while the second half has encrypted with AES that ciphered with random xor cipher algorithm then embedding in wave audio by used Least Significant Bit (LSB) algorithm then streamed to server. This method can trick the attacker to focused on hashed value that appears with streaming data while the part of key hided within the cover file. Password Authentication --- Cryptography --- Steganography --- AES --- Audio Steganography. Image content verification is to confirm the validity of the images, i.e. . To test if the image has experienced any alteration since it was made. Computerized watermarking has turned into a promising procedure for image content verification in light of its exceptional execution and capacity of altering identification. In this study, a new scheme for image verification reliant on two dimensional chaotic maps and Discrete Wavelet Transform (DWT) is introduced. Arnold transforms is first applied to Host image (H) for scrambling as a pretreatment stage, then the scrambled host image is partitioned into sub-blocks of size 2×2 in which a 2D DWT is utilized on each sub-block to produce corresponding sub-block of DWT coefficients (LL, LH, HL and HH). Meanwhile, watermark image is encrypted using the introduced chaos-based enciphering algorithm. The watermarked image is obtained by updating the approximation coefficients (LH sub-band) of each 2×2 sub-block of DWT coefficients of the host image with the enciphered watermark image bits. Different investigational tests are performed to evaluate the act of the introduced approach. Investigation results clearly present that the proposed approach can detect and localize editing attacks perfectly. Index Terms— Arnold Transform --- DWT --- Duffing Map --- Image Watermarking. Improving the performance of visual computing systems is achieved by removing unwanted reflections from a picture captured in front of a glass. Reflection and transmission layers are superimposed in a linear form at the reflected photographs. Decomposing an image into these layers is often a difficult task. Plentiful classical separation methods are available in the literature which either works on a single image or requires multiple images. The major step in reflection removal is the detection of reflection and background edges. Separation of the background and reflection layers is depended on edge categorization results. In this paper a wavelet transform is used as a prior estimation of background edges to separate reflection. Experimental results verify the effectiveness of the proposal in the speed and accuracy.